Inside: Curious about what you should never use in a toaster oven? You’ll be surprised by the materials and baking dishes that don’t belong in your fabulous little oven. Our readers are the best. Those questions take me weeks to research and write about. Always leading to another question that needs to be answered first. Because before you can become a toaster oven cookie baking expert you have to know how to test the accuracy of your toaster oven’s temperature. And every time Tim and I learn something new about how to use our toaster oven too! Now, I know what you’re thinking. This is simple stuff, Brie. There’s your basics: no paper towels, no paper plates, no cardboard. And of course, plastic lids and containers are out. But what about ceramic dishes, pyrex, stoneware, aluminum foil, coffee mugs…. 1. Does the toaster oven manufacturer say it’s okay to use that type of dish, pan or accessory in their toaster oven? 2. Does the product manufacturer say their product is toaster oven-safe? Some answers we expected while others were quite surprising starting with the first thing you should never put in your toaster oven. This was the most shocking for us. From my junior high school Home Economics class to cooking in my family’s kitchen I learned to use Pyrex dishes for everything but the stovetop. Short of being dropped, I would have sworn they were indestructible and the best dish to use for any recipe. Recently, I grabbed an 8 x 8 glass pyrex baking dish to make a double-batch of our balsamic roasted cranberries. Two gorgeous jars filled with tart and tangy cranberries later I was cleaning up the pan and notice something disturbing. The glass was splintered and frosted in the corner. Almost like it had shattered within itself. That dish had just baked its final recipe. I will now be spending this Sunday afternoon marking up any recipe on Toaster Oven Love that uses a pyrex dish with a huge warning. Because Pyrex is clear that their product is not toaster oven-safe. So even though the toaster oven manufacturers we contacted said it was safe to use a glass dish in your toaster oven Pyrex says not to and we trust they know more about their products than anyone else. But the thing is stuff is okay until it’s not. In this case “not” could mean your glass pan shattering into pieces on your kitchen or dining room table. 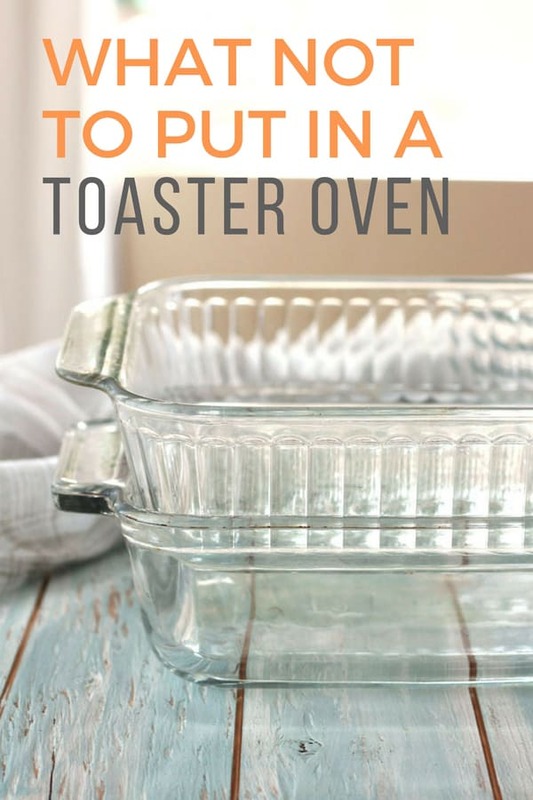 If you’re looking for options on what to replace your glass baking dishes with check out this post for 9 New Ideas for Toaster Oven Baking Dishes, Pans and Accessories. A few years ago mason jars hit their peak. Suitable for more than just canning, you can find mason jars being used for creative on-the-go salads, overnight oats and some people are even baking cute little pies and cakes in them. Unfortunately, Ball the leading mason jar manufacturer says the glass in their jars “is not tempered for oven use and is not meant to be used as bakeware” in their FAQ. 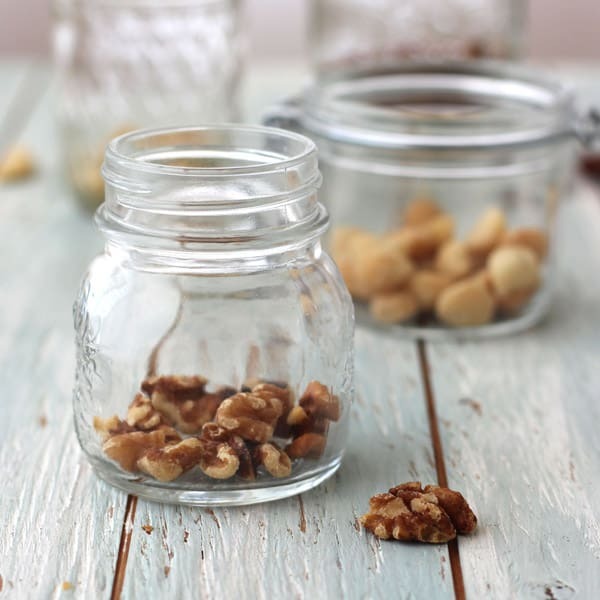 While mason jars are still fine for storing nuts, transporting salads and making fridge oats they should never be used in any oven including your toaster oven. This one’s a little tricky because most toaster oven manufacturers will tell you it’s okay to use parchment paper in their toaster oven. But if you read our cooking baking tips post then you already know the parchment paper manufacturers, including Reynolds Kitchens, say you should not put parchment paper in a toaster oven. 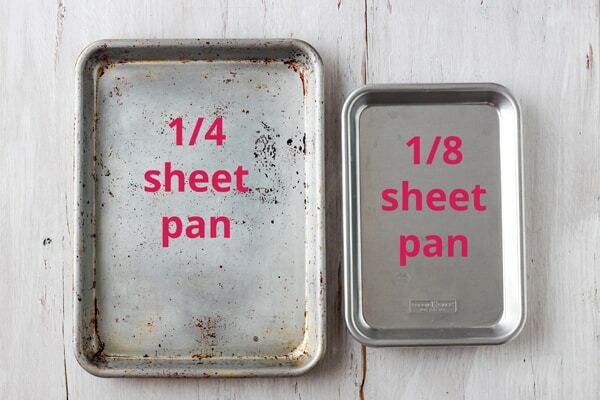 Instead, you can lightly oil your pan or use a small silicone baking mat. Silicone mats are designed to be used in your toaster oven, easy to clean, and reusable. If you’re cooking for just one or two people single serving mug cakes are a fantastic idea for getting your sugar fix without a bunch of tempting leftovers. Our kitchy coffee mug collection (and yours too) is most likely unsafe to use in a toaster oven. 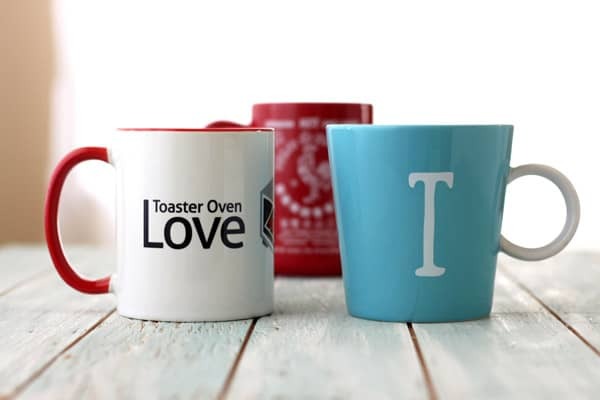 While the safety level of baking with ceramic coffee mugs is debatable, most rarely have temperature and use directions printed on them (like oven-safe or broiler-safe). Seems best then to keep your favorite Sriracha mug out of the toaster oven and use a ramekin instead. We looked at 8 different toaster oven manuals to see if aluminum foil could be used in a toaster oven. Some manuals included specific instructions for using aluminum foil in their recipes. Others warned against it entirely. Most noted that if used, do not let the foil touch the toaster oven’s heating elements or walls because aluminum foil can melt onto surfaces (like the walls) and catch fire when in direct contact with a heat source (since it’s flammable). As you can see from the differing instructions across the manuals we looked at foil does not have a simple yes or no answer. Like a lot of things with toaster oven cooking, what’s right for you is going to be a combination of what your manual says is okay, what the foil box says is okay and your best judgment. ALL of the manuals did agree on one thing. Covering your crumb tray or drip pan with aluminum foil is a recipe for disaster. A layer of accumulated grease can easily be heated high enough to start a fire in your toaster oven. Food that has fallen onto the foil will be elevated closer to the heating elements and could catch on fire. NEW! 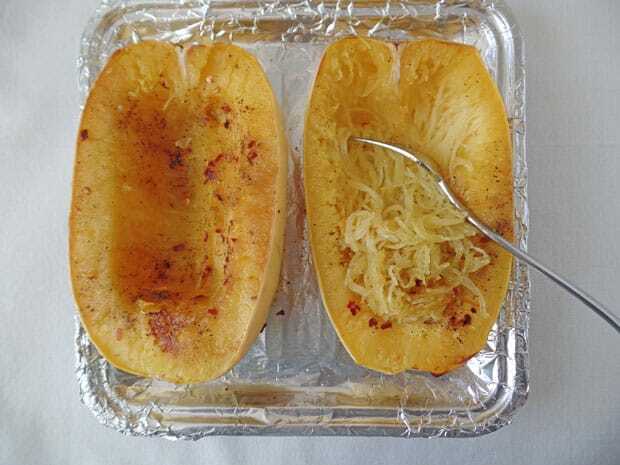 : Check this post about using foil in a toaster oven for more info and lots of great toaster oven cooking tips! So What Can I Cook With In My Toaster Oven? Your toaster oven manual. Look to see if your manufacturer has included a list of different types of cookware/materials you can use in their toaster oven. 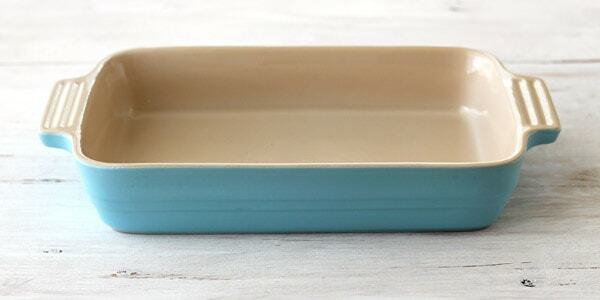 The Use & Care Guide for your baking dish. But if you’re like us you probably tossed that when you bought your dish. Fear not, it can usually be found on the product manufacturer’s website. If you don’t have the manual or need more information call the manufacturer directly. We found the customer service for both Breville and Cuisinart friendly and informative. From your basic 8×8 square baking pan to specialty donut pans the options are only limited by the size of your toaster oven. For most dishes, a sheet pan will get the job done. Below are referral links to our 2 favorite baking sheets (before purchasing any pan for your toaster oven make sure to measure the interior!). 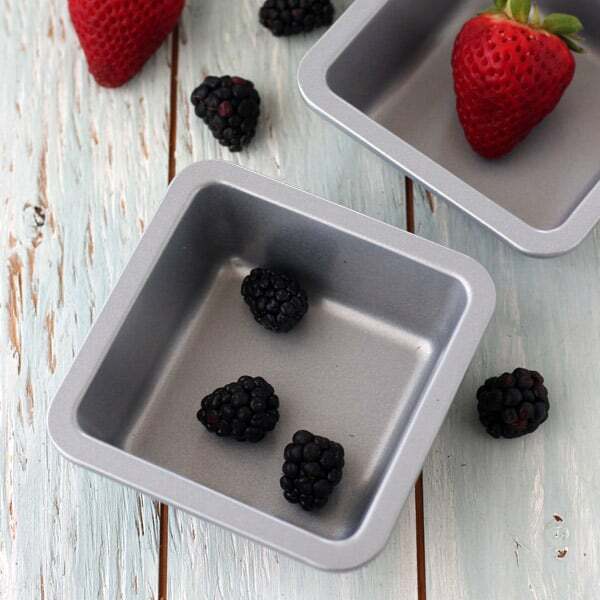 In our smaller toaster oven, we love using this 1/8 Nordic Ware Baking Sheet. If you’ve got a larger countertop oven with extra space you can’t go wrong with a Nordic Ware Quarter Sheet Pan. Also, we’ve recently updated the toaster oven cooking essentials page to focus on the best toaster oven pans. An awesome reader named Susan emailed this week asking if we knew of any good metal ramekins. We were stumped at the time. Then we stopped by Michaels because what’s a weekend without a trip to the craft store right? 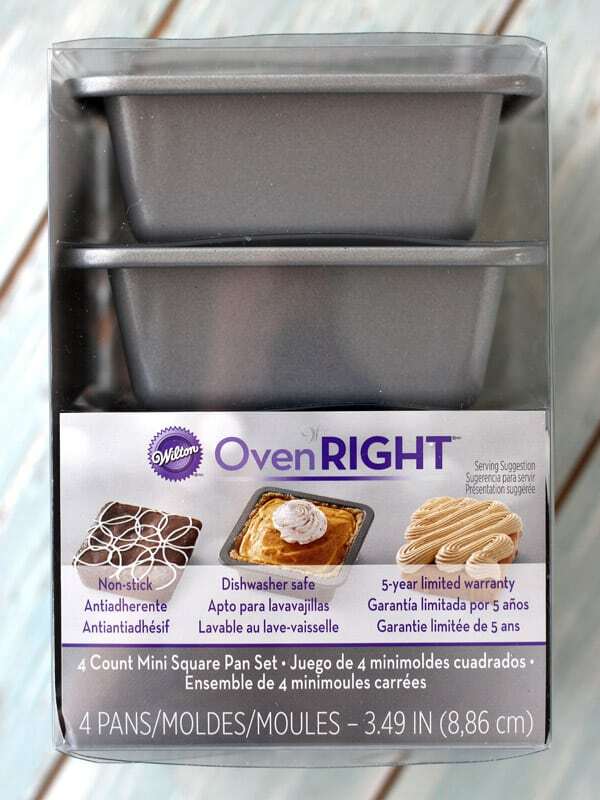 A quick trip down their baking aisle delivered these cute little square metal pans. A set of four was around $11 before our 40% off coupon! Each pan is 3.49 inches, can hold up to 8 ounces. To see these mini pans in action check out this moist and deliciously spiced Toaster Oven Carrot Cake. If you don’t have a Michael’s nearby, you can use this referral link to purchase the pans on Amazon. Wilton actually has a lot of mini pans that would be perfect for baking individual sweet and savory treats too. Cast iron pans are another great toaster oven option and come in a variety of sizes. 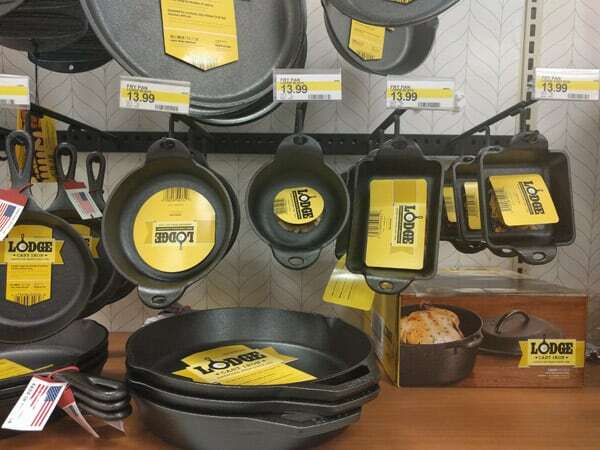 Yesterday, while at Target we spotted a display full of smaller cast iron pans. Although the pans are pricey, if cared for properly your investment could return a lifetime of tasty toaster oven dishes like this mini berry skillet cake or a toaster oven frittata for two. One thing to note about cast iron is that it’s very heavy. If your toaster oven’s wire cooking rack is made with thinner tines it may not be able to support the weight of a heavier cast iron dish and could bend or sag. This category was the most difficult to nail down. That’s because almost all stoneware and ceramic dishes have the potential to crack in a toaster oven due to the uneven heating of the elements. For every single piece, I received confirmation could be used, I guarantee you will able to find an online reviewer saying it broke in their toaster oven. At least I didn’t come across any “exploding” ceramic or stoneware stories like the Pyrex, so there’s that. I found this beauty, a 10 x 7 inch (that’s an interior measurement the handles make it closer to 12 inches) Le Creuset casserole dish for $19.99 at our local Homegoods. So far we’ve roasted baby carrots in it and made a tasty mixed berry compote. The dish heated both recipes evenly during cooking and was a breeze to clean up. After reading a few reviews online about the stoneware cracking I emailed Le Creuset directly. Two days later they replied saying that as long as I could fit the dish in my toaster oven it was safe to use. 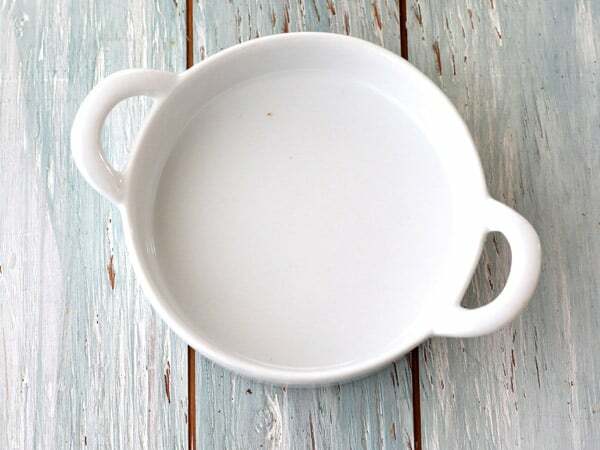 We also own an assortment of ceramic and ceramic-coated stoneware ramekins and dishes. Most of them don’t have any heat-safe instructions (like oven-safe, freezer-safe, safe to 350 degrees) on the bottom. Though I was able to confirm with Sur La Table that the ceramic creme brulee dishes I purchased from them are toaster oven-safe. The toaster oven manufacturers we called stated as long as it said “oven-safe” any ceramic dish could be used in a toaster oven. 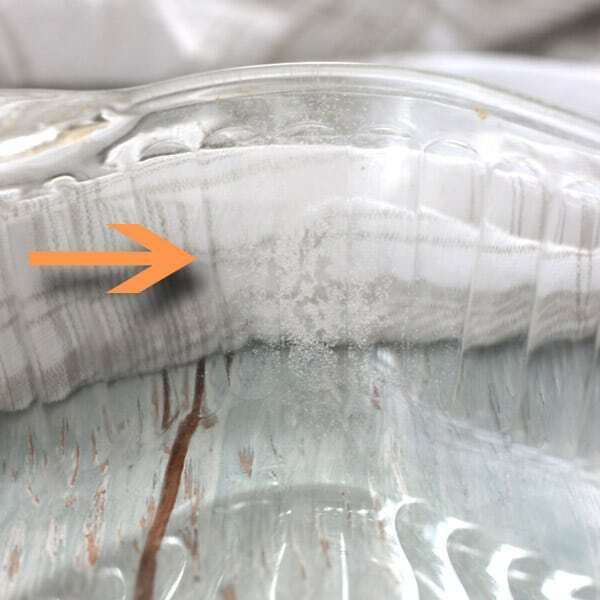 Why you should always check the Use & Care Guide for your baking dish! Last year when I did research for this article and checked out the safety of our own dishes I read this general Corningware’s FAQ which has a statement that it’s okay to use them. So even though a company may have a general FAQ, it might be different for the SPECIFIC DISH you want to use. Corningware, like a lot of companies, has individual use and care directions for each of its pieces. The best way to know if yours is okay to use is to visit their website and search for your baking dish. 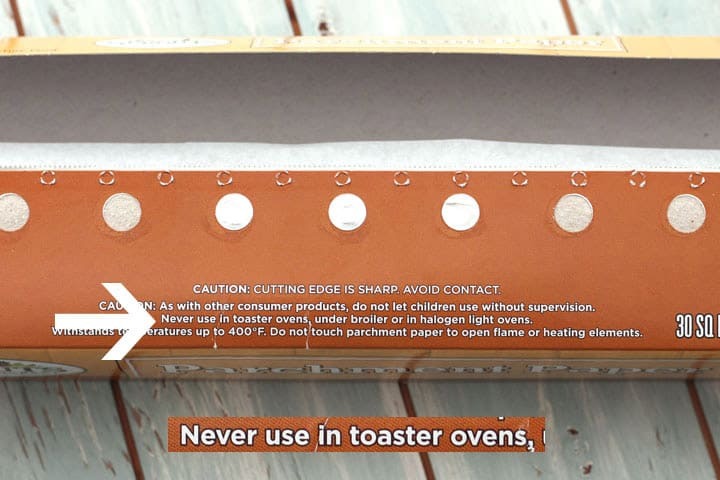 Once you’ve located the product page, click on the Care & Use tab in the middle of the page and look for instructions or warnings about toaster oven use. With ceramic and stoneware dishes the yes and no’s will always vary. If you can’t find the Use & Care guide your next safest bet is to contact the product manufacturer directly. 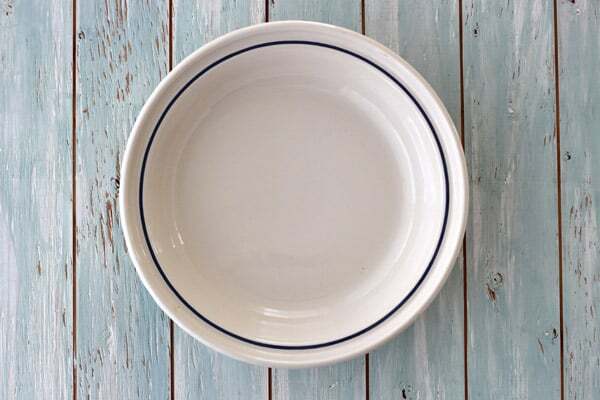 Take our 15-year-old ceramic pie dish from Longaberger. I had high hope for it since the bottom states it’s oven, dishwasher, microwave and freezer safe. But Tim gave them a call and a very nice CS Rep verified it was not safe for use in the toaster oven. She explained that because of how close the heating elements are to the pan it could heat unevenly and damage the ceramic. One last thing worth mentioning is that none of our stoneware or ceramic dishes are rated as broiler safe. If you’re looking to crisp up an item or melt cheese with your broiler it’s best to use the roasting pan that came with your toaster oven or a metal pan. Have you found a great toaster oven-safe dish or have a brand to recommend? Please help us and each other out by sharing in the comments. HELP ! Farberware Air fryer Toaster Oven must be 8″ from wall and overhead cabinets ???? I,m ready to return before using . Walmart says it,s for safety. Wow, that’s a pretty big requirement, especially for the overhead cabinets! Most conventional and convection toaster ovens recommend about 4″ to 6″ distance between cabinets and walls. The Air Fryer feature is probably responsible for the increased amount. It’s for safety and performance. The exterior of most toaster ovens get super warm while in use and to work properly they need space to vent hot air from the top and sides. If you don’t have that much room available, I’d look at a few other ovens. For any that you’re interested in you can check out the manual on the manufacturer’s website to see their space requirements before purchasing. I have a large Cuisinart Toaster/Convection Oven. I use it amost exclusively except when I cook larger portions for guests. I bake in Corning Ware casserole dishes all the time (for years) with no problem in it. All my Corning is vintage. Modern Corning ware is not made of the same material as the vintage and IMHO….is not good for lots of things. So…hang on to your vintage Corning Ware for all oven use. If you don’t have any…head over to Ebay….or buy only the line of Corning that says its like the vintage. I believe they have a line of it. Happy toaster ovening! I am blown away by learning of all the pans/dishes that shouldn’t be used in my toaster oven. I live in a tiny home and don’t have a regular oven, so I use my toaster oven a lot. Without the information you offer here, I have used every pan I used to use in my regular oven. I bake cakes, pies, cookies, potato casseroles- – oblivious to the warnings. I am saddened to learn I can no longer bake as usual, baking for family get togethers,etc. Does no one else bake full-fledged. cakes, pies, casseroles in their toaster ovens? I am elderly on Social Security and cannot afford all the toaster oven pans you suggest. Do you suggest I stop baking like I have been with all the wrong pans? Though I am perplexed, I do appreciate the info you have provided. It’s just that I love to bake and I make all the cakes for our family celebrations!! I know this information can feel overwhelming and frustrating at first, it was for us too. But hang in there, you may find you have more options than you think. The warnings we linked to come directly from the manufactures (we didn’t create these warnings – we just compiled them in an easy to find place). Personally, I’m of the belief that a company wants to sell their product to as many people as they can and are only going to tell me not to buy/use it for a good reason. So I’d suggest you follow the Care & Use instructions provided by the manufacturer for your specific baking dishes. 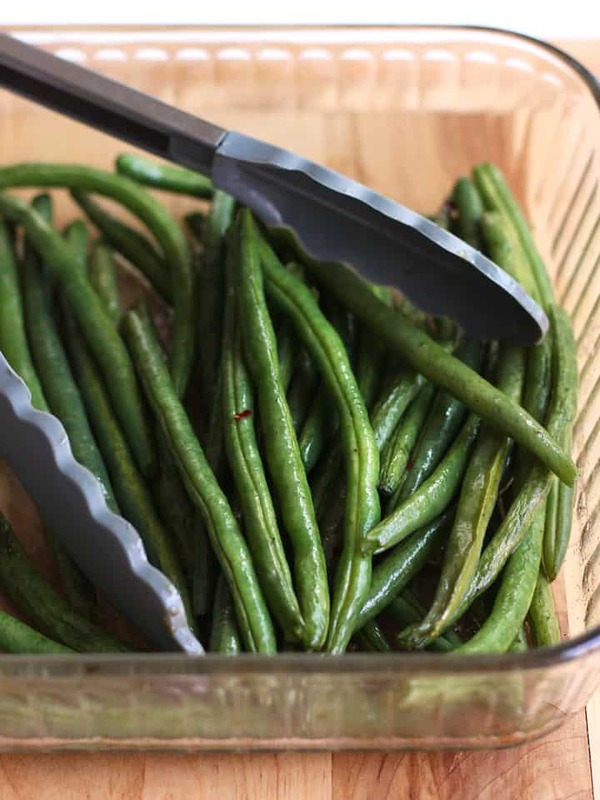 Did you see our first suggestion of using metal pans? They can be found in pretty much any size or shape. If cost is a concern I’ve seen metal pans at yard sales and Goodwill – also family and friends are a good (and free) resource you just need to let them know you’re on the lookout. Growing up my family baked all kinds of goodies in metal pans and I know lots of readers bake pies in metal pie pans and full-sized cakes in 9×13 metal pans – there’s absolutely no reason you should stop baking!! I really like my Farberware toaster oven pan set I got off of Amazon 5+ years ago. They are metal and are still non-stick. Great for broiling filet mignon or baking bacon or a personal pizza. Hi Sheila! Thanks for sharing about your Farberware toaster oven pan set, we’ve got the same one and have been very happy with it too. The cake pan is great for making small batch granola! I am shopping for a toaster oven and want to get a smaller one that we can use in our small motorhome as well as at home. I want to be able to use pans I already have. Regarding using cast iron in a toaster oven: I have some Descoware (vintage enameled cast iron, predecessor to Le Creuset) small baking casseroles with lids that would fit a toaster oven. Can enameled cast iron be used in a toaster oven? Le Creuset does not specifically mention toaster ovens in their usage guidelines; I am waiting for a response from their CS regarding this question. I use “Bakers Choice” brand parchment, which comes in sheets rather than on a roll, and nowhere on its packaging does it advise against toaster oven use. Granted, it doesn’t endorse it either, but I have never had any issues. That’s a great question, Trish! But last year I did reach out to Boxiki, they’re a silicone baking pan manufacturer that has some neat products on Amazon. Their friendly customer service advised me that “Our product are best used in a regular oven.” And the Wilton CS that I spoke with said they’ve heard of people using their silicone pans in the toaster oven but had not tested it themselves. Maybe some readers who’ve used silicone baking pans will chime in? 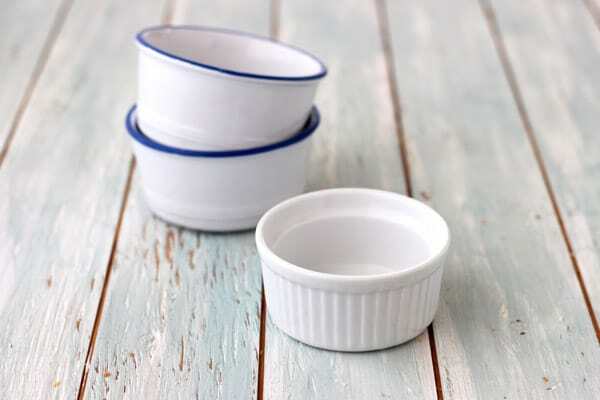 HIC (Harold Imports) baking dishes and ramekins are broiler safe. I would expect they would be safe in a toaster oven as well, if they can withstand broiler heat. Silicone bags on Amazon, Stasher is one brand. I looked on their website- said they are oven safe. Thank you for sharing this amazing tips! I got a tons of paper cups for cupcake baking 🙁 so i should not never use this paper cups in toasteroven? I also use a baking paper sheet for cooking a chicken or any type of roast foods. should not be used in toast oven right? Those are great questions! Unfortunately, I haven’t seen a consistent answer for them. A lot of manufacturers of toaster ovens with a rotisserie feature have recipes with instructions for trussing meats with twine but some don’t. Same for the paper baking cups. Also, I’d skip the parchment paper or baking paper sheet. Any thoughts on using stainless steel in a toaster oven? I Googled it but that mostly yielded results for toaster ovens made out of stainless steel. Which makes me think, if there are ovens made of SS, it’d probably be fine to use SS in said oven… Anyway. I also trust your judgment the most in this area! Hi Vanessa, your logic is sound 🙂 The oven-safe baking rack we use with our quarter sheet pan is stainless steel and it does fine. If you end up with a favorite SS pan for your toaster oven, we’d love to hear about it! I am glad to find your site before purchasing a toaster-oven/countertop oven appliance. I was considering a small unit for my RV and another for the kitchen. I am not a cook at all. Another item to add to the Do not use list are some of the convenience frozen entree dinners. I am beginning to understand the reason being the close heat source. I will rethink the idea as I also have a range of glass ovenware baking dishes. These apparently will not be usable. The RV has a microwave which I sense may stop working and I gave up a microwave in my kitchen after the last one failed after a few short years. I used a toaster-oven back in my college day apartment quite often. Great tip on the frozen food containers, if they’re made from plastic or a coated paper they’ll usually be marked as “do not cook in a toaster oven.” If we’re making something like that, we usually transfer it to a small ceramic or stoneware dish. You might find Christine’s comment at the bottom of that post helpful, she purchased a low-wattage toaster oven for her camper and has a great muffin tin tip. We just bought a toaster oven!!!! So excited that maybe I’ll cook more?!?! Now I’ve read the skimpy users manual and decided to search and found your awesome site. I’d like some clarification: I’m an avid collector (you may say hoarder!) of vintage items. My Corningware is the original, as is my Pyrex. Can I use the old stuff in the toaster oven? Also, do I ever cover my food while it cooks in the toaster oven? Hey, Liz, congrats on your new toaster oven! Unfortunately, we don’t own any vintage Pyrex or Corningware so we haven’t had a chance to try either in our toaster oven. Maybe other readers have and will chime in with an answer? If we did though, I’d skip the Pyrex just to be on the safe side. 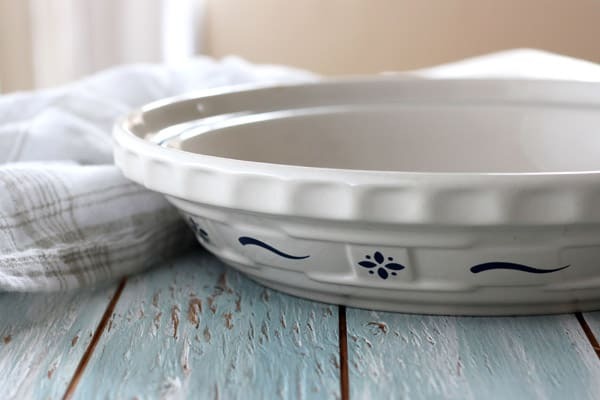 To be super sure your Corningware won’t crack it’s probably best if you give Correll a call and ask them, here’s a link to their contact info. If you’ve got a 1 or 2 quart Le Creuset dutch oven in your collection that might be a good alternative if the Corningware is a no-go for some reason. You should cover your food when the recipe you are cooking calls for it. But make sure to check the “Important Safeguards” section in your toaster oven’s manual. Our Breville manual warns to be cautious because “as pressure build-up in a covered pan or dish may cause hot ingredients to expel or the dish to crack.” Also, they expressly warn not to use airtight containers. Recently, we’ve been using the large pizza pan that came with our toaster oven to cover casseroles dishes during baking and it’s been working out really well. Excellent and thanks for the quick reply! I’m using the pan it came with to cook bacon (yup, my first attempt!!) uncovered and I’m so excited. The manual is TRULY skimpy and has no information on cooking techniques so I’m hoping to do it right – or call them! I’ll definitely give Correll a call and I appreciate the contact information! Quick tip: once the toaster oven cools down, give the inside a wipe down with a damp cloth (don’t forget the ceiling) this will remove any bacon grease from the walls and keep your toaster oven cleaner over time. A great resource for a lot of different toaster oven cooking techniques, especially meaty items, is YouTube. If you want to perfect your bacon baking skills 🙂 there are a bunch of videos. I was ecstatic about finding your site. My gas range oven was recently knocked out when lightning took out the electonic control panel(a purchasing mistake that I will never make again) that operates it so I’ve been using my toaster oven a lot. Tonight I needed info on baking potatoes & there you guys were. I just wanted to point out that pyrex is not ceramic, it’s borosilicate glass. I’m not sure because I haven’t googled it yet but, I bet the Corning stoneware is a ceramic/borosilicate glass combo. Anyway, thanks for all the info. I adore your site. Keep up the good work. Thanks for the kind words and welcome to the toaster oven cooking club, Marie! Sorry to hear about your oven, I would have never thought that could happen to the electronic control panel (lightening! ), such a bummer. Pyrex is now made with tempered soda-lime glass not the borosilicate glass. 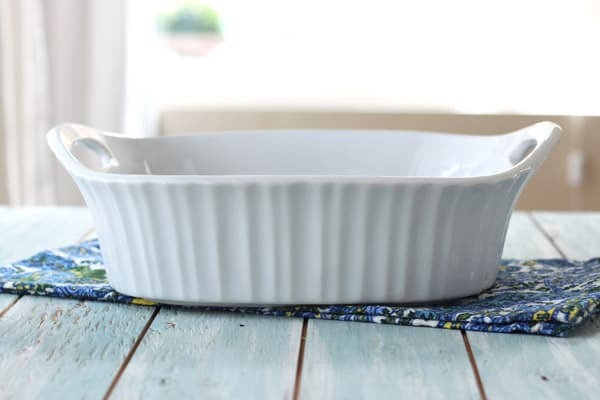 The old Corningware was made with pyroceramic glass that could go from the freezer to the oven and be used on the stovetop. The new Corningware, like our dish above, is now made from a ceramic coated stoneware and is not freezer or stovetop safe. I have a couple of vintage Corningware baking dishes that came with detachable handles for stove top use – the Cornflower design. Corningware site says these are ok for toaster ovens, but no the clear glass lids. There is a safe way to use parchment paper in most toaster ovens, though it requires a bit more creativity than most cooks engage in. Fold a length of parchment paper around the sandwich, patty, dough, etc. which you wish to warm or cook. Then, fold the overhanging edges tightly up or staple them together (only on two sides), in order to make a “sandwich bag holder/pouch” out of the parchment. Then, repeat that same process to cover the outside of the “parchment pouch”, using a section of aluminum foil (though only fold the edges, don’t use staples for any reason). Fold over all three edges of the aluminum foil and you have a safe, secure way to warm or cook the contents, without risking fire or any potential aluminum contamination. Be sure to open the contents slowly and cautiously, to prevent steam burns, once the cooking/warming time is completed (you could puncture small holes in both layers of coverings, if absolutely essential, but this is highly unlikely to be necessary). Once the warmed or cooked food product has reached the cooked temperature desired, it’s possible to carefully remove that food item in such a way that that aluminum “jacket” will be reusable for numerous similar toaster oven activities (thus does NOT need to be a one-time-use-only-concoction – helping preserve our environment, while, also saving time). Potentially, (depending on how much oozing and dripping occurs within the parchment paper inner lining “pouch”), it may, also, be possible to safely reuse that paper part of the cooking “tool”, as well. Either way, this toaster oven cooking strategy is highly portable for anyone, from children to the elderly to transport “home-cooked meals”, especially for those perpetually living “on the go”! I regularly use a handmade heavy stoneware bowl topped with a Ruska plate as a lid. (Make-do casserole) So far everything’s been all right. The Corningware Etch looks nice as a replacement idea. Thanks for the info about parchment paper. 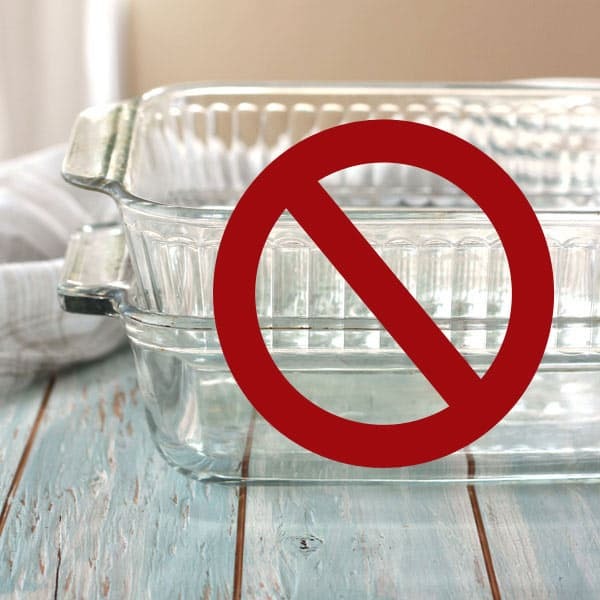 The Corningware Etch is actually one of the brands that’s not toaster oven safe. Welcome to the club Linda! In fact, we accidentally thought our crumb tray was a cookie sheet and practically ruined our first toaster oven. We’re working on a cleaning post for next month sharing all the embarrassing photos and everything we’ve learned since then about keeping a toaster oven clean. If you ever have any questions we’re happy to try and help. Good luck with your toaster oven cooking adventures! Thanks for the hours of research! Great info! I always use the metal tray that came with my toaster oven and cover it with non-stick tin foil – yikes! But, have never had an issue. Since I cover the pan and the foil is not flapping around, it never hits the sides or elements so maybe that’s why I’ve never had a problem. I have also used my Pyrex ramekins! Won’t be doing the anymore. The foil is a tricky one and more of a personal choice for sure. Like you we’ve always secured it tightly around the baking pan and never had a problem. I think the bigger issue is people covering the drip pan with foil which I gather happens way too frequently. And darn those Pyrex dishes! They’re the perfect size too…such a bummer. Thank you so much for this information. I’m one of your readers who emailed you asking about sources for toaster-oven pans. I’m off to our local Michael’s to check out the pans. By the way, our Wal-Mart has quite a large selection of Lodge cast iron. That could be another source for your readers. Thank You for the great question Olwyn! Fantastic tip about the cast iron at Walmart, I’m sure many readers will appreciate the extra options.